Gleek Attack: Grilled Cheese & Tots! 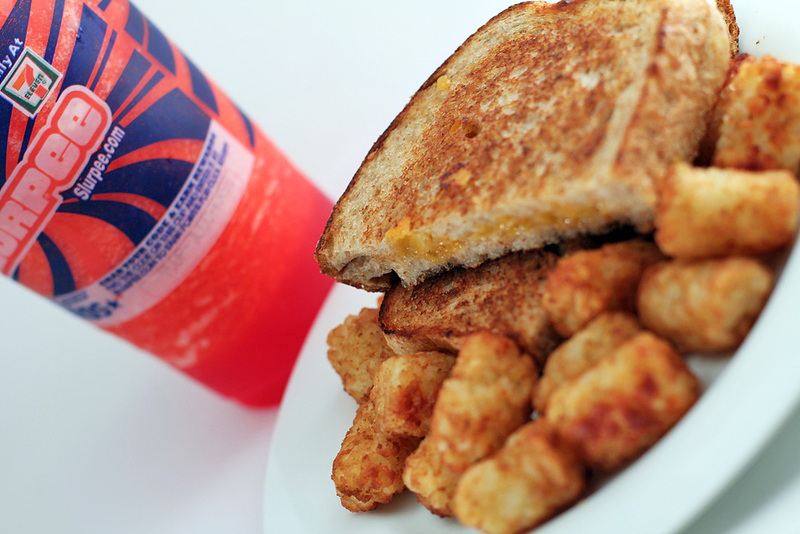 Although not blessed with a “grilled cheesus,” we still consider this Glee dinner a success: the ultimate grilled cheese, tater tots, and an ice cold slushy! This grilled cheese may not be a sign from above, but it sure tastes heaven sent! Slather 2 slices of Companion Peasant Wheat Bread with soft butter or margarine, arrange 2 slices of Cheddar cheese and 2 slices of Monterey Jack cheese Tetris style between the unbuttered sides of bread, and place in a skillet over medium heat. Toast until the bread is crispy and the cheese is completely melted. The Companion Peasant Wheat bread really does make this sandwich incredible. If you live in the Saint Louis area – definitely give this a try!! Confession of a *wannabe* foodie… Everything on this plate is the same color, the tots are straight from the freezer section, the slushy is from the gas station, and there are no greens, but occasionally… totally worth it! 2 Comments on Gleek Attack: Grilled Cheese & Tots!